Udaipur : Ariel has been unearthing the reality of inequality within households since 2015 with their award-winning movement #ShareTheLoad.Ariel hosted a panel discussion with over a 100 mommy bloggers and media present to discuss the prevalence of gender disparity in India and the need for Sons to Share TheLoad. The panel that comprised of actors Rajkummar Rao, Patralekha, Director Gauri Shinde, BBDO Head Josy Paul, and Sonali Dhawan, Marketing Director, P&G India, brought forth insightful conversations and personal anecdotes on the disparity within households, and changing times today. They shared that while more men today are sharing the load than ever before, we are still many steps further from the ideal state of an equal future. The panel also went deeper into the latest Ariel film- Sons #ShareTheLoad that raises yet another pertinent question in this direction -Are we teaching our sons what we are teaching our daughters? – the film urges mothers of today’s generation to raise a generation of equals. The newly-released edition of #ShareTheLoad, has resonated with many parents, newly married couples, influencers and has already received tremendous support and commendation from audiences across India. The film that released on January 24th, 2019 has already garnered 15 Million views in total. Ariel #ShareTheLoad movement started inIndia to address the household inequality that exists in our society. In 2015, Ariel raised a very relevant question – ‘Is laundry only a woman’s job?’ to draw attention to the uneven distribution of domestic chores. With the 2016 ‘Dads Share The Load’ movement, the conversation was aimed at unearthing the reason for the disparity, which is the cycle of prejudice passed down from one generation to the next.The movement has had a significant impact over the years, with more men sharing the load than ever before. In 2015, 79%* men thought household chores are a women’s job. In 2016, 63%* men thought household chores are a woman’s / daughter’s job and ‘outside’ work is man’s / son’s job. In 2018, this number has reduced to 52%*. Despite progress, more work is still to be done. 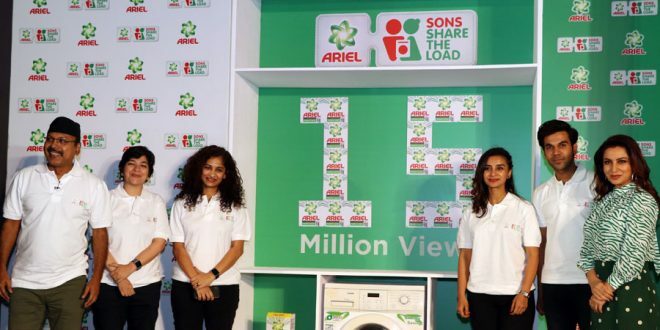 Towards this, #ShareTheLoad recently launched the third leg of the movement with Sons#ShareTheLoad because, with Ariel, laundry becomes the easiest chore to start sharing the load with!